It’s fair to judge presidential candidates by the company they keep. Donald Trump is getting support — and seeking it — from some of the murkiest, creepiest corners of the Internet. On Saturday, the day Hillary Clinton was interviewed by the FBI, the GOP presidential candidate tweeted out an image of her on a background of $100 bills, accompanied by six-pointed badge with the words “most corrupt candidate ever.” But the image wasn’t just the usual partisan dig. It had appeared previously on a message board frequented by white supremacists and neo-Nazis. In context, the badge evokes a star of David and implicitly links Clinton with conspiracy theories about Jews. This is only the latest example of symbiosis between the Trump campaign and the so-called “alt right” — the alternative universe of white nationalists, authoritarians, Internet provocateurs, and other off-brands that are too diffuse, idiosyncratic, or disreputable to fit within the official Republican mainstream. A campaign isn’t responsible for the views of every last one of its supporters. But Trump’s flirtation with the so-called alt right goes far deeper than a single tweet. Indeed, the New York developer’s national political profile is built on a cause dear to white supremacists: the (demonstrably false) idea that the first black president wasn’t really born in the United States. For half a century, the American conservative movement policed itself in a disciplined way. Under the guidance of William F. Buckley, Ronald Reagan, and others, the very term “conservatism” took on a highly specific meaning: a hawkish approach to foreign policy, support for law enforcement and big business, opposition to taxes and regulation, an embrace of traditional social values. Even as Republicans courted the votes of Southern white ex-Democrats alienated by the civil rights movement, the GOP’s official argument — that smaller government is good for everyone — was color-blind. Over on the alt-right, they’re not so coy. The neo-Confederates, neo-Nazis, and other blood-and-soil types who are embracing Trump’s campaign aren’t interested in the intricacies of the GOP candidate’s tax policy. It’s his condemnation of Muslims and Mexicans that they like. In fact, many of Trump’s ideas — not just his anti-immigration rhetoric, but his isolationism, his insinuation that Obama may be covertly plotting against the United States, and his admiration for Russian strongman Vladimir Putin — find a convenient philosophical home in the alt-right. Trump is having it both ways: He’s recirculated alt-right themes on numerous occasions, but he’s pleaded ignorance — or blamed the “dishonest media” — when called out for doing so, and he’s disavowed anti-Semitism more generally. 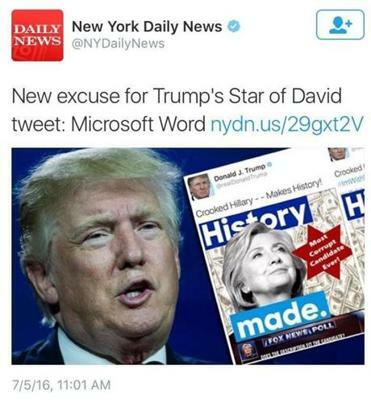 Taking the fall for the six-pointed star incident, Trump’s social media manager, Dan Scavino, insisted that the campaign had lifted the picture from a more generically “anti-Hillary Twitter user where countless images appear.” Scavino lamely added that the six-pointed star was a standard Microsoft shape. On Tuesday, House speaker Paul Ryan called on Trump to “clean up” his social media operation. Really, Team Trump couldn’t even criticize Clinton’s e-mail scandal without help from hate groups? It must be tempting for Ryan and other GOP luminaries to ascribe the fiasco to mere political malpractice by operatives like Scavino, because the other possibility is worse: Trump is entangled enough with the alt-right that he can’t quite see the harm in it.